Financial market shocks: do they matter for the economy? Financial markets are intrinsically volatile, constantly fluctuating in response to a wide variety of news. 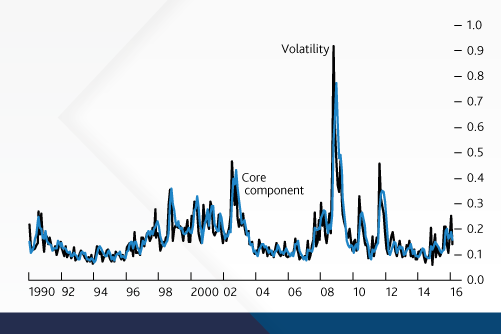 Often, these shocks to volatility are short-lived, perhaps reflecting a one-off adjustment in asset prices or the market’s overreaction to news, and have a tendency to dissipate rapidly. But sometimes they lead to a sustained increase in market volatility, reflecting a deeper uncertainty over the future macroeconomy that can take time to resolve itself. Indeed, a considerable body of empirical evidence suggests that financial market volatility is made up of two components: a slowly varying ‘core’ component and a ‘transitory’ component that dissipates quickly. We develop a way to identify each type and estimate how they affect the broader economy.